The offshore wind farms Meerwind Süd and Meerwind Ost are a 288 MW project located in the German Bight in the North Sea 23 km north of the island of Helgoland. The wind farm consists of 80 wind turbines with a power output of 3,6 MW each. All turbines are connected to a farm internal transformer platform to which the grid connection has been installed. 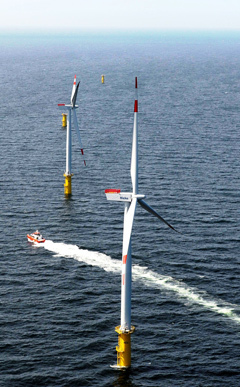 The location is one of the most promising in the emerging offshore wind business in Germany. The main advantages of the location are the combination of best offshore wind conditions with convenient water depth of 22 m to 26 m and the nearby island Helgoland to be used as a maintenance base. Based on the German Renewable Energy Laws, the risks for the project are minimized as the feed-in tariff is fixed for the first 13 years and the grid operator is responsible for the grid connection both to and at shore. Construction with installation of the first Monopiles has started in September 2012. After only 18 months all 80 turbines as well as the topside had been installed. Meerwind Süd | Ost is one of the first commercial offshore wind farm projects in operation in Germany.